A tree in the middle of the room becomes a colorful centerpiece. 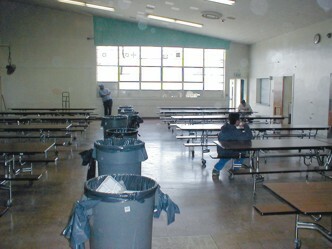 Before: The standard long institutional tables with open trash cans in a room with bare white walls. The large, filled trash cans are not very appetizing. After: Bright, bold colors on the wall artwork and sparkling glitter finish on the seat backs makes this room glisten! Check out the colorful tree in the center of the room in a huge movable planter. 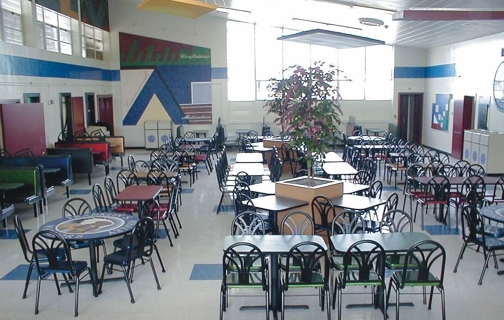 Also – tabletops with inlaid mascot logos.